One of the most spiritually dangerous mistakes we can make is to compartmentalize our thinking into separate sections: Facts/values. Sacred/secular. Worst of all, God/real life. If Jesus truly is Lord—and His word says He is—then there is not so much as a solitary atom, much less an entire compartment, where He does not belong. So I love, love, love it when writers and speakers help us tear down mental and spiritual walls to help us live life as a unified whole. And now there’s a new voice to help women think biblically and rightly about how we glorify God in our homes. 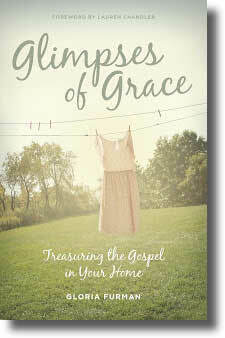 This week marks the release of Gloria Furman’s book Glimpses of Grace: Treasuring the Gospel in Your Home. I’ve never read a book that so thoroughly explores the way God’s grace can so fully and vibrantly radiate into even the most mundane and seemingly unimportant parts of life. Her great, dry sense of humor is studded throughout the book, such as: “I need God’s grace and something baked with peanut butter and chocolate.” What’s not to love? • God can use the ordinary moments in your life to glorify himself by conforming you into the image of his Son. That is precisely what he intends to do. Dirty dishes in the sink or red crayons smushed into an electrical socket by a curious toddler are not just worrisome ordeals in your otherwise uneventful day. They’re opportunities to see glimpses of grace. • Jesus apparently believes that the most satisfying thing for us in all eternity is to behold his glory in his very presence. He is not absent from our noisy, chaotic lives. He is with us, even to the end of the age (Matt. 28:20). And if he’s with us even to the end of the age, then he is with us even to the end of our carpooling route. He’s with us even to the end of the meat in the fridge when grocery day isn’t for another four days. He’s with us even to the end of a long night of waking with a crying baby. He’s with us even to the end of a party that we’d rather not be at or be hosting, for whatever reason. He’s with us even to the end of a hectic morning of rushing around trying to get out the door. He’s with us even to the end of a dreadful day when nothing seemed to go as planned. • God’s efficacious grace could be described in terms of the different ways you put pajamas on a baby. My son prefers to streak after he takes baths. He even tries to climb out of the tub early before everyone is soaped up and rinsed in order to increase his odds of getting to run around in his birthday suit. . . . But it’s all fun and games until a naked baby has an accident on the carpet, so I quickly chase him down to put on his diaper. Some nights he runs away shrieking and hides under tables and behind chairs trying to avoid the inevitable. Some nights he quietly lies on the bed while I diaper him, and he might even stretch his legs into the pajamas I hold up. Either way, whether I have to wrestle his clothes onto him or he peacefully submits to the work I am doing, that boy has never gone to bed without a diaper and pajamas on. Of course, we should love to submit to God’s efficacious grace as he purposes to make us more like Christ! But sometimes we’re like a naked baby hiding behind the couch, reluctant to hold still and thankfully allow God to work in our hearts and get us ready for what he has next. • We’re destined for joy forever because of Christ’s exquisite hospitality in opening a way to God through his own body. We can serve others with gladness, knowing that the carrots we peel and the diapers we change are as unto the Lord. . . . When we show hospitality in this way, we can see how “God is able to make all grace abound to you, so that having all sufficiency in all things at all times, you may about in every good work” (2 Cor. 9:8). Our role is to serve with the strength God supplies, and it’s God’s role to do with our service whatever he pleases. He supplies the strength, and in his abundant hospitality he also gives us joy! God’s grace in Christ is for us to enjoy and share with others. When I have this grace in mind, I can see my possessions and others’ needs in light of eternity. • My disgusting kitchen floor and its propensity to absorb filth is a picture of our hearts. No matter how hard we scrub, we cannot erase our iniquity. The shame of our sin is like the phantom stain on a shirt that reappears after you’ve dried it. The stain is deep in the fibers of the shirt, and when the right temperature of heat is applied, the stain rises to the surface of the fabric. The stain is permanent. • Not making an idol out of our homes is tricky. I’ve personally experienced what it feels like to be obsessed with the idea of organization in my home. I thought I was being driven by the maxim “God is a God of order and not chaos.” I thought that if everything had a place, then my heart would feel at peace because strict orderliness is godly. But instead of worshiping God, I just wanted to be in control. I was worshiping my image and thought it wouldn’t be so bad if others admired me, too. . . .I’ve also had struggles with the idol of self-expression, seeing my home primarily as an extension of myself. If something was out of place or not just so, then I felt it reflected poorly on my personhood or character. Again I was serving my own image—not God’s. • Jesus is the sovereign Lord over every square centimeter in your home—from the pipes to the television to the mattresses. He is Lord over it, and he desires that you use what he’s given you to glorify him. That doesn’t mean that your home needs to be perfect by the world’s standards or even by your own personal standards, but consecrated by God’s standards. . . . In Romans 12:1-2 we see a description of what it means to set ourselves apart for God: “I appeal to you therefore, brothers, by the mercies of God, to present your bodies as a living sacrifice, holy and acceptable to God, which is your spiritual worship. Do not be conformed to this world, but be transformed by the renewal of your mind, that by testing you may discern what is the will of God, what is good and acceptable and perfect.” Since Jesus is lord over all things and God is subjecting all things under his feet (1 Cor. 15:27), including our homes, by his grace we use our homes to worship him. See why I loved this book? Let the gospel permeate every square inch of your heart and your home. I bet Glimpses of Grace can help. This blog post originally appeared at blogs.bible.org/tapestry/sue_bohlin/glimpses_of_grace_knocking_down_mental_walls on June 4, 2013.